Not by new alignment but by cosigning with other routes via IH 10 to I-410 in San Antonio's east side, then southwest via I-410 to IH 35. 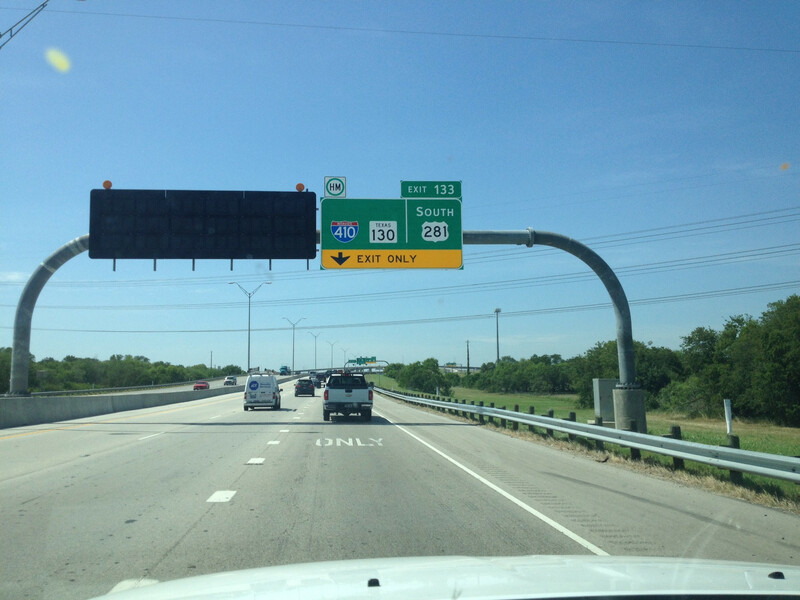 I'm not sure why they need to extend SH 130 on a needless concurrency when proper signage could do the trick just fine. Besides, what's to say that upgrading the southern portion of Loop 1604 to freeway or tollway to I-35 wouldn't be better?? We'll file this one in the "TxDOT trying way too hard to get people to use a toll road" folder. The concession company put photos of some of the new signs in its Facebook account. I remember some people complaining about misleading drivers to get them to follow 130 along I-10 expecting to get to Austin or Waco and being surprised that it suddenly becomes a toll road. It could be argued that the concurrencies are unneeded and are just marketing for the toll road, but at least the signs shown aren't misleading. 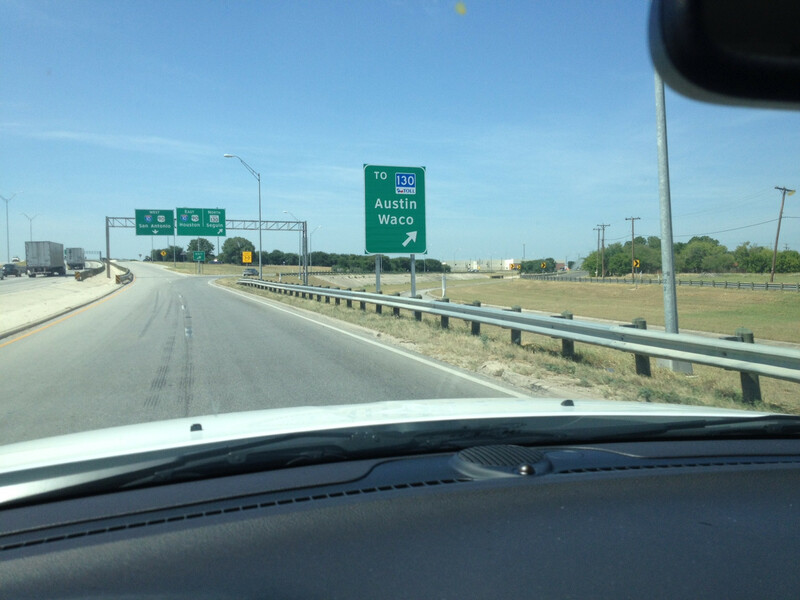 Any time Austin and Waco are mentioned, it shows the toll road sign. 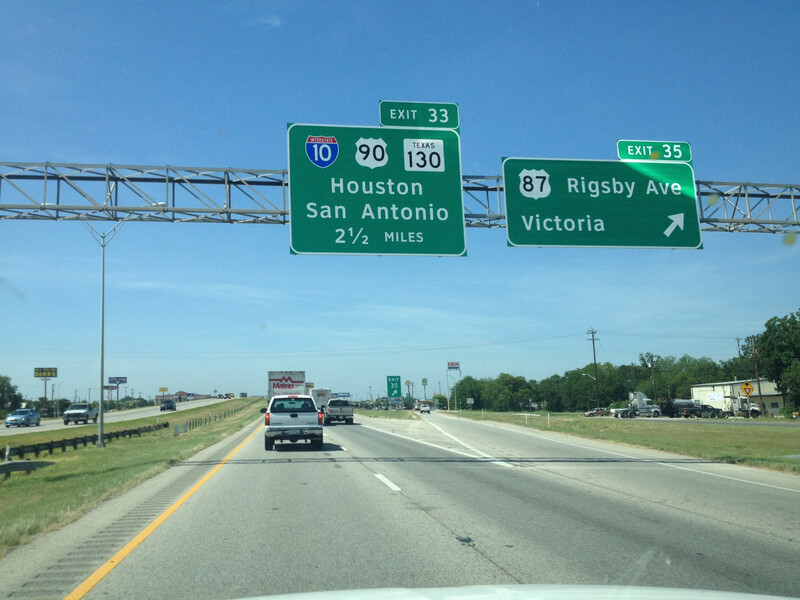 The only destination shown for the regular State Highway 130 sign is Seguin. I'm sure some people will be confused, but there's only so much you can do to account for inattention. At least Waco is mentioned as a control city in San Antonio. I wonder if Dallas/Ft Worth would be next, or maybe in lieu of Waco. When the speed limits were increased to 75 on the other Texas Interstates, I-35 between Austin and San Antonio was excluded. When the higher speed limits were approved for the Austin district state and US highways, I-35 was excluded again. After the new speed law was passed, I read that the plan was to increase the speed limit. This signing may have been what they were waiting for before increasing the speed limit. The agreement with the concession company makes an increase on the parallel portion of I-35 a "compensation event," due to its potential to disincentivize use of the toll road. The PDF file is an image, not text, so I can't copy the text, but it says that the compensation due to the company because of an increased speed limit on I-35 is reduced by the amount of increased revenue attributable to a southern extension of the SH 130. TxDOT may not still plan to raise the speed limit on I-35 - 70 is the default and 75 is discretionary, so it isn't legally required - but if they do increase the speed limit these signs may be their way of preventing, or counteracting, a compensation event. Maybe none of it will matter if the company goes bust. Interesting...if the company does go under, and SH 130 is returned back to the state, would that make it easier for the proposal to re-route I-35 along it and SH 45 SE to gain support? I don't expect that would help. If TxDOT got the south half of the road back, they have no reason to stop the tolls. They consistently want more tolls, not less. Even if they wanted to make the big switch with I-35, they still have bond debt on the CTTS, which includes the northern half of 130. I don't think it's worthwhile to divert long-distance traffic off the less-congested part of I-35 parallel to SH 130 Sections 5 and 6, and then direct it back onto I-35 through Austin. If the company goes under, I think the best outcome would be to reduce or eliminate the tolls on the south half and make the full bypass cheaper, hopefully drawing more traffic off the whole parallel stretch of I-35. Even then, I doubt if it makes a big difference (but, of course, I'm guessing and am not an expert in that field). I'd guess not, since the affected section is the new portion south of SH 45 SE. However, a default would probably allow TxDOT to lower the tolls to cover maintenance alone (and possibly drop them lower if they were to cross-subsidize from SH 45 and SH 130 1-4), which would attract more traffic. Then again a private operator probably could do the same, too. Didn't Texas consider numbering it I-35E?